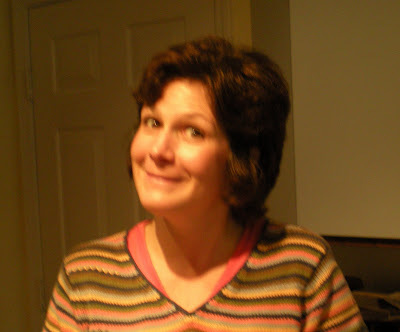 It's Thankful Thursday over at Mary's place today, and I'm joining in the fun. Today I'm thankful for my neighborhood. I live in a typical suburban neighborhood, but what makes it so special is the people in it. Over the years our kids have walked to school together, played in the leaves together, and trick-or-treated together. The adults have parties together. But we also attend holiday programs together and help each other take out the leaf bags. It's a fun place. At any given moment, I can walk down my street and find someone to talk to. And in an emergency, I know that pretty much all of my neighbors would be here in a heartbeat. Anyway, today some friends from my neighborhood got together to make Spanakopita.The lovely Irene who lives down the street was teaching us. This sweetheart is "Yia Yia" to all the neighborhood kids. Everyone knows her, and everyone loves her. And occasionally Yia Yia gives cooking lessons to some of us non-Greeks. Bless her heart. Today we met at Amy's house. This is Amy. This picture is blurry and doesn't do her justice because she's beautiful and sweet and smart and the closest thing to a sister I have living here. This is Johanna. Johanna is a nut and tons of fun to be with. She also rolls a mean spinach pie. 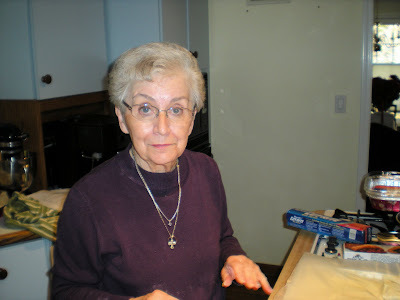 And this is Yia Yia. Like I said, we all love her. So, basically, spanakopita is spinach pie. You can make it in a pan or you can make individual triangles like we did today. 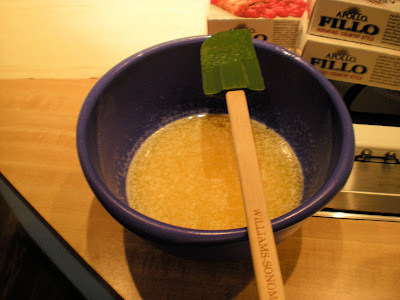 As every Greek recipe does, you start with butter. Lots of butter. You also need filling. You can find out how to make this if you check out the recipe below. And, of course, phyllo dough. This is the Greek country style phyllo which, apparently, is a bit thicker than regular phyllo. 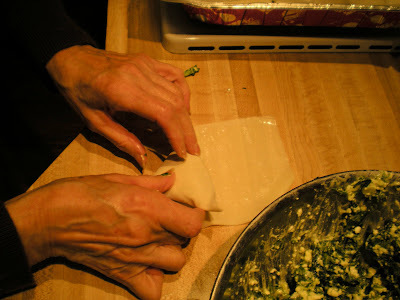 So you cut the phyllo into thirds, like Irene's hands are showing us below. Take the strips, one at a time, and brush them liberally with butter. Did you catch that? I said liberally. 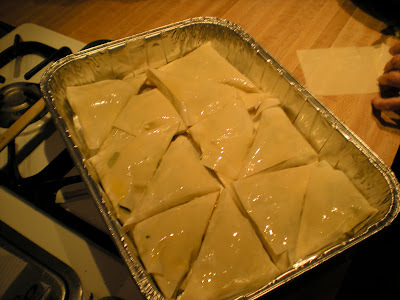 Put a spoonful of filling at one end of the strip of phyllo and then start working it into triangles. I'd try to explain how to do that, but it would probably turn into a dissertation, so I'll just let you look at the picture and figure it out for yourself. Or make it in a pan, which is probably easier. We put the individual triangles into foil pans like this with waxed paper between the layers. Be sure to brush them with butter before you refrigerate or freeze them. Because we haven't used enough butter just yet. I guess all you have to do after that is bake them and eat them. Which we did. This morning. And, boy, were they good. Mmmmmm. You can try these too because Yia Yia shared her recipe with me. She even said I could share it with you. I've typed it out exactly as it was given to me (except that the comments in parentheses are mine) so go ahead and give Yia Yia a call if you can't figure it out. How could you not enjoy all this buttery goodness? Step #3: Crumble 1 lb. of feta cheese (make sure it's good feta--Yia Yia does not like the flavorless domestic feta) and 12 oz. 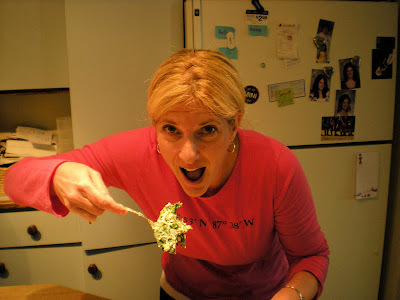 of cottage cheese (drained through a seive) into spinach. Add a pinch of mint and a pinch of parsley (we used about 1/2 bunch of fresh parsley) and 1 bunch of green onions sliced. Step #6: Layer filo in pan. Butter each layer. Blanket it over sides so as all 4 sides are hanging over edges. First 4 sheets you do this and then 5th-10th sheets don't overhang, they get placed on the bottom of the pan only. Continue to layer filo, butter, filo, butter, filo, butter. Step #7: Put filling over filo and spred out so it's all even. Make sure you get it in the corners. Sprinkle another handful of rice over the filling. 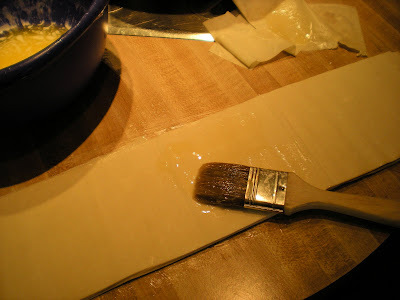 Step #8: Fold edges of filo over filling. 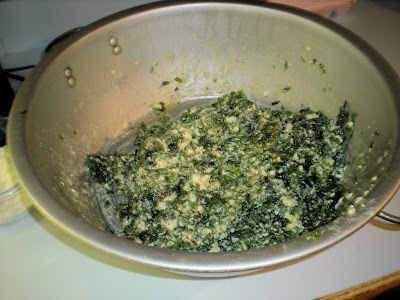 Butter edges and layer remaining filo over spinach. Filo, butter, filo, butter and so on. 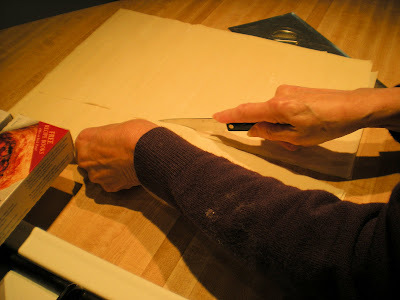 Step #9: Cut excess filo away from edges and tuck sides down to seal. Step #10: Cut it into squares. Brush a little butter on the top. Step #11: Bake at 350 for about 1 hour. The top should be golden brown. Start on the bottom rack and check in 1/2 hour. Rotate pan if necessary. 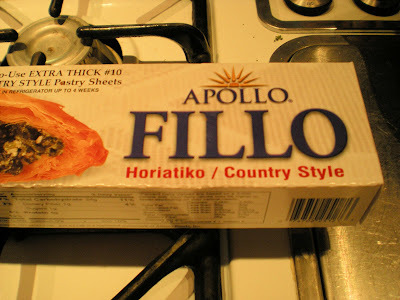 Enjoy all that filo, butter, filo, butter, filo . . . I REALLY want to try to make these. YUM. So fun to see your friends! You have such an interesting life. I didn't know Irene's name but I DEFINITELY know Jamocha! It's fun to read about life on the other side of the block! Oh, Linda, I don't know if I'd go so far as to call it interesting. But that's nice. Kate, we're making baklava next month. Come on over!! Mmm...yum! That looks delicious!! But even better - what a cool community you have in your neighborhood. I love that! Adam would be proud! I'm going to remind him about Christmas and reading this blog.....Can't wait for the baklava recipe.